Happy New Year to all you Dartford tweeters! Here’s the next date for your diary – Monday 20th January, 7:30 at the Royal Oak in Dartford. A chance to huddle together for shelter against January’s seemingly incessant wind and rain. If you like planning ahead then also put Monday 17th February and Monday 17th March in your diaries too – the last of those is St Patrick’s day! As usual, though, dates and venue are all a matter for feedback from you. If you want to change day, frequency, venue.. just make a suggestion via the Comments, or at the next session. Meanwhile, a few notes on December’s gathering. These were delayed by the Christmas season, and may be a little faded as a result. Again – let me know if you’ve got any feedback or points to add. There were 11 of us this time, so the group is still growing, and we had new faces in the form of Andy L, Andy B and Kate. I also had messages from about another ten people. Although there were some conversations that included everyone, particularly at the start, there was more of a tendency for us to break up into smaller conversations and one-to-ones, particularly as there were more people to get to know. I think this worked fine, and there was an easy-going pattern of people joining in when they overheard something across the table. The town centre and planning – ideas about land use in the very centre of town and the best use of the former Co-op site. But more generally the planning process and how to engage people with the Town Plan – which actually has more influence than late-in-the-day public input to individual applications such as Tesco’s. Music – personal preferences, old bands… giving way to some reminiscing amongst oldies like me. Various sorts of web proposition to benefit the town. There will probably be more discussion of this on the Google+ Dartford Community in the New Year. But it’s becoming clear that there are several different things this could be; from the fully functional “web street” for Dartford retailers floated by @mikejharrison [with payment and delivery capabilities], to a more general ‘directory’ of local businesses, organisations and events. [See Tenterden for an example of one variant]. How a Dartford web presence was funded, managed, sold, endorsed and so on, would vary a lot for each of these variations. 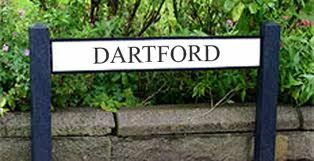 Some of them also point towards a fully online extension of Dartford Living, so it would be good to see @vijayfromkent at a future #dartfordtweetup. … and of course, Christmas. There were probably lots of other conversations that I didn’t hear, or that have slipped my memory courtesy of all the Christmas festivities. So let me know, or add a Comment, if I’ve omitted anything important. That’s because these posts are building into a bit of a history of the tweetup and also give an idea, to people who are thinking of coming along, of what #dartfordtweetup evenings are like.